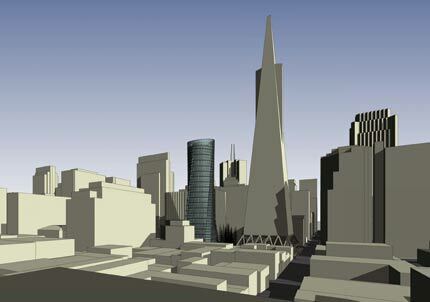 In comparison to the Transamerica Pyramid, 555 Washington Street looks small, but its approval would immediately threaten lowrise neighbors to the north. On April 15 the San Francisco Planning Commission will again take up the proposed 38-story 555 Washington Street Tower, designed by Heller Manus. At its March 18 meeting, the commission certified the project's EIR. At an earlier hearing, on February 11, venerable community activist Sue Hestor asked them, “Does ‘new urbanism’ say that we have to fight suburban sprawl by putting 400-foot buildings everywhere in San Francisco?” Hestor has a point. For far too long smart growth has meant density über alles on both sides of the Bay. The result is a dog’s breakfast, for the most part, much of which has little to do with walkable urbanism and nothing to do with urbanity. It’s time to get nuanced about density. As 555 Washington demonstrates, density’s context is not just the block itself—the immediate environs—but what is influenced and perhaps threatened by its increase. The 555 Washington tower disregards current zoning for the block it shares with William Pereira’s 1972 Transamerica Pyramid, still the tallest building in the city. Next to it, the new tower doesn’t look so big, of course, and it comes with a packet of ground-level amenities. For Heller Manus, best known for political acumen, the design is OK: cribbed from the late-modern playbook, but OK. All of this has won it an endorsement from SPUR (San Francisco Planning and Urban Research Association), an important advocacy group in San Francisco. So far, so good—I can imagine the trail of logic that brought SPUR on board. It all seems fairly harmless, and if it violates the planning code in the process, well, the code’s out of date anyway. So why should the Planning Commission hesitate to move ahead with 555 Washington when it takes it up again in mid-March? Here are three good reasons for them to slow the tower down and reconsider its larger context. Dropping a housing tower into the Pyramid block continues a sorry tradition of case-by-case rezoning in San Francisco. Back in May 2009, San Francisco Chronicle critic John King—addressing the 555 Washington tower specifically—spoke up for “a re-imagined, focused plan for the financial and retail district.” He also noted the price the city pays for not having one: “As long as downtown is up for grabs, in effect, count on the process to grow more strident and cynical.” San Francisco’s Planning Department may be hobbled by the downturn, King observed, but isn’t the real opportunity of a downturn to plan intelligently for the future? The Pyramid block is on the northern edge of San Francisco’s Financial District, considerably past California Street. To its north, the buildings are much lower, an eclectic mix whose tenants benefit from its current density. This is where you find two of the region’s best bookstores, City Lights and Stout’s, and many of its best dealers in the decorative arts. You want urbanity? It starts here, yet the area clearly thrives because of its proximity to the financial district. Shanghai, facing the same dilemma, has opted to preserve similar areas like the Puxi district, recognizing—as Singapore did not—that they are irreplaceable. This is why SF’s planning code sought, a generation ago, to preserve the area. Let’s give its framers some credit for foresight. The question 555 Washington raises is not whether it’s inappropriate for its site, but what happens next. As UC Berkeley’s Peter Bosselmann, a professor of urban design, once pointed out to me, adding density at the edge puts pressure on the lower-density neighborhoods that adjoin it. He was talking about the Rincon area, but the comment is even more applicable to the north end of the central business district, where recent and proposed projects along Kearny Street are also testing the higher-density waters. A generation ago, KPF’s building at 600 California had to step down to blend in with lower buildings to the north. Today, a developer doing the same project would be likely to use the occasion for mixed-use, assuming the planning code holds. If enough exceptions to the code get approved, the current edge is unlikely to hold. The question to ask of density is what does it really contribute to the city? This takes in everything: scale and mix, design quality, effect on microclimate, synergy with surrounding uses, transit access, etc. As we rezone, so shall we reap. Instead of giving 555 Washington a pass, the Planning Commission could send a powerful message to the city and the developer community: no more case-by-case exceptionalism. There’s never been a better time than now—the lull before the resumption of business as usual—to take a comprehensive look at how the central business district should grow, gaining rather than losing urbanity, and how much added density, if any, the districts north of it should absorb. These are the real and pressing issues. The tower can wait.